Israeli forces detained at least 26 Palestinians in raids across the occupied West Bank before dawn Wednesday. Israeli forces carry out detention raids across the occupied territory on a near-daily basis, with the UN recording an average of 95 weekly raids in the West Bank in 2016, and 100 weekly raids on average thus far in 2017. According to prisoners’ rights group Addameer, a total of 6,500 Palestinians were held in Israeli prisons as of January, including 300 minors. The group estimates some 40 percent of the male Palestinian population has been incarcerated by Israeli at some point in their lives. Israeli forces launched multiple raids in towns and villages across the southern occupied West Bank district of Hebron, detaining at least 11 Palestinians. Local activist Muhammad Ayyad Awad said that several houses were raided in central Beit Ummar as well as in the al-Bayyada area of the town. Israeli forces raided the house of 40-year-old Raed Muhammad Mahmoud Ikhlayyil and detained him. According to Awad, Ikhlayyil was not able to move properly as he was suffering from a live gunshot wound in his pelvis that he sustained after being shot by Israeli soldiers in December at a funeral for his relative Khalid Ikhlayyil, when at least 20 other mourners were shot. Two others were also detained after Israeli soldiers raided their homes in Beit Ummar, identified by Awad as 19-year-old Muhammad Ghazi Issa Zaaqiq and 16-year-old Muhammad Mahmoud Abdullah Awad, who were taken to the Etzion military camp in northern Beit Ummar. Awad added that 28 Palestinians have been detained in Beit Ummar since the beginning of 2017, including 11 who were under 18 years of age. Meanwhile, in the town of Dura, Israeli forces detained Dafaa Hantash, as well as Youssef Shahin and Nour al-Bustanji from the Wadi al-Shajina area after raiding and searching their homes, according to local sources. An Israeli army spokesperson confirmed one detention in Dura, and informed Ma’an that raids in Hebron also saw three Palestinians detained in Sair and two detained in Deir Razih. The spokesperson also said that two Palestinians were detained in the village of Husan in the southern occupied West Bank district of Bethlehem. The Israeli army also released a statement saying that 12 illegal vehicles were confiscated in Husan. Local sources in the central occupied West Bank told Ma’an that Saad al-Zghayyar was detained in the Jerusalem district village of Kafr Aqab, and that Rami al-Barghouthi was detained in the Ramallah district village of Kafr Ein. An Israeli army spokesperson confirmed the two detentions, saying that the detention in Kafr Ein targeted an alleged Hamas operative, though she did not identify him by name. She added that elsewhere in the Ramallah district, Israeli forces also detained a Palestinian in Bilin, four in Nilin, and one in Kafr Nima. three were confiscated in Bilin for allegedly being used in clashes. 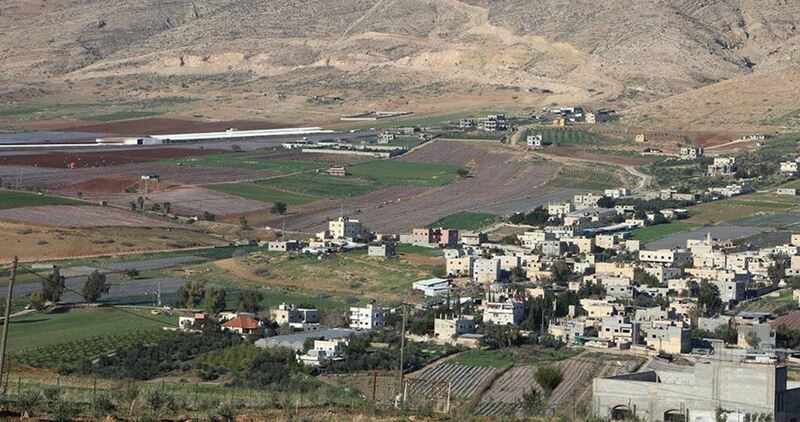 In addition, the Israeli army said three Palestinian-owned vehicles were confiscated in Bilin, while a locally-made weapon was allegedly found and confiscated in Kafr Nima. 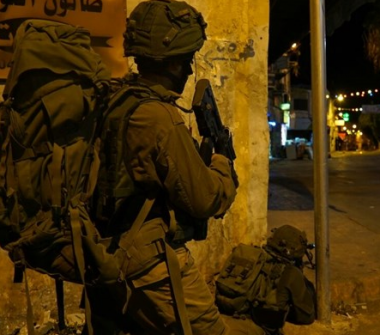 Locals in the northern West Bank district of Qalqiliya said that four Palestinians were detained during a predawn raid in the village of Azzun, who were identified as Hamed Jamal Abu Haniyeh, Zaid Ali Abed al-Hafez Adwan, Firas Mahmoud Shihadeh Hussein, and Nidal Safwan Mansour Salim. 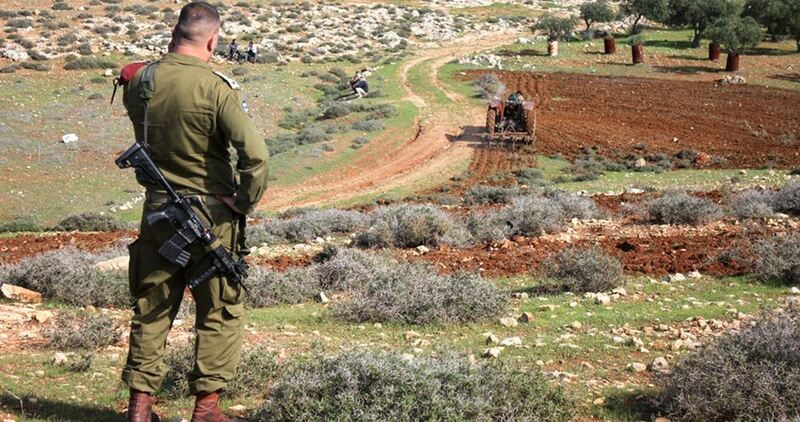 An Israeli army spokesperson confirmed four detentions in Azzun. Locals also said that one Palestinian was detained in the village of Beit Furik in the Nablus district. 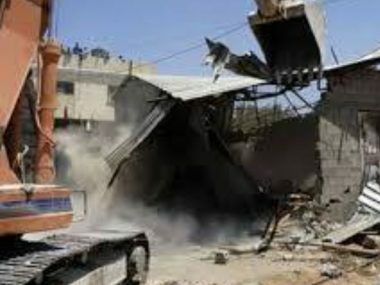 The Israeli occupation bulldozers on Wednesday morning knocked down three Palestinian homes in Hizma town, to the northeast of Occupied Jerusalem. 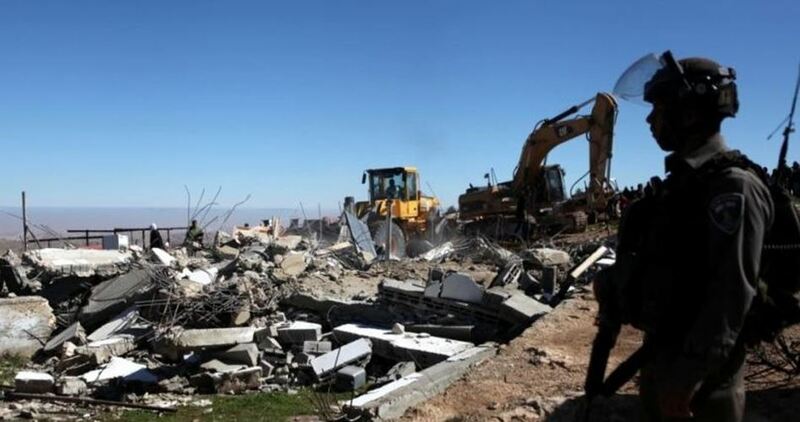 Head of Hizma local council, Moufek al-Khatib, said the Israeli bulldozers, escorted by armed officers, stormed the town and razed three Palestinian homes to the ground. Al-Khatib said the targeted homes belong to the Palestinian citizens Ahmad Shahada, Abdul Aziz Shahada, and Jabr Abdul Hameed. Five Palestinians sustained injuries after the Israeli forces showered the area with sound bombs. At the same time, Israeli cops stormed a Palestinian school in Silwan town, to the southeast of Occupied Jerusalem, in the hunt for alleged anti-occupation stone throwers. A series of checkpoints was also pitched by the Israeli forces across Silwan, where Palestinian civilians have been subjected to intensive questionings and crackdowns. Israeli bulldozers demolished Wednesday morning a number of Palestinian-owned facilities in the Negev, Quds Press revealed. Quds Press quoted local sources as affirming that Israeli forces demolished a Palestinian house in the unrecognized village of Za’roura in the Negev. The demolished house was owned by a disabled woman, the sources added. 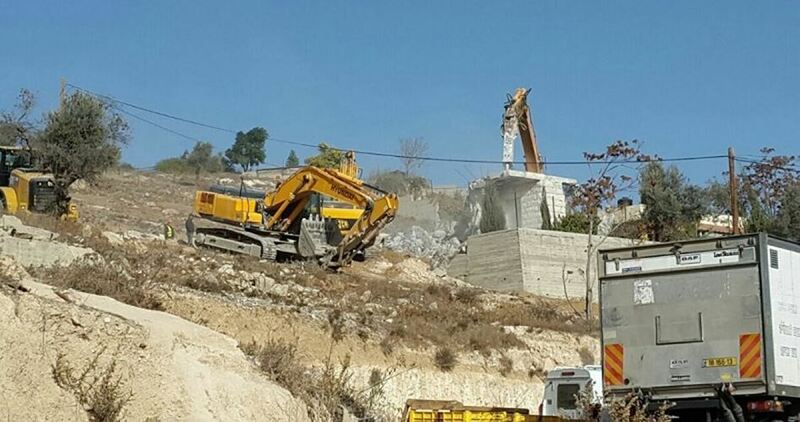 Meanwhile, Israeli bulldozers leveled a bus station in Rahat city under the pretext of being built without permit. The sources pointed out that Israeli forces were deployed since the early morning hours in large numbers in the Negev villages accompanied with a number of military bulldozers. Head of the Regional Council of Unrecognized Villages of Negev Atia al-Assam said that the demolition process came as part of Israel’s plan to evacuate the unrecognized villages in Negev. He stressed that Palestinians in Negev are determined to confront Israeli demolition and displacement policies. 2016 saw a marked increase in the number of homes Israeli authorities demolished throughout the West Bank, including East Jerusalem, citing lack of building permits as a pretext. The scale of demolitions documented by B’Tselem this year is the most extensive since we began systematically documenting demolitions in 2004. 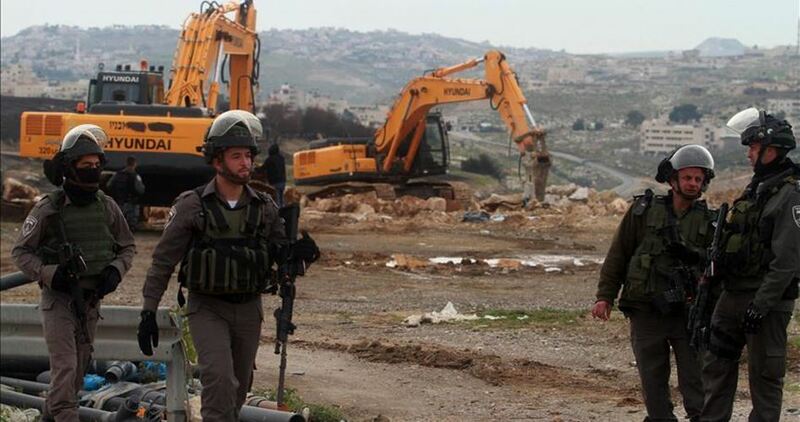 In East Jerusalem, authorities demolished 88 residential buildings and 48 other structures. 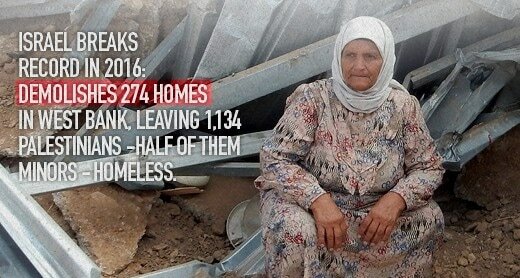 Elsewhere in the West Bank, authorities demolished 274 residential buildings and 372 non-residential ones. These demolitions are indicative of Israel’s efforts to limit Palestinian presence in the areas it seeks to take over, taking advantage of planning and administrative tools to that end. In August 2015, Israeli authorities waged an unprecedented demolition campaign across the West Bank, destroying some 100 structures, half of them residential, which were home to over 200 people, including roughly 100 minors. The wave of demolitions, considered at the time as unusually extensive, was unofficially halted in late 2015 due to the Jewish and Muslim holidays. Authorities resumed the demolitions in early 2016. As the months went by, what had seemed in late 2015 as exceptionally extensive demolitions became the norm and part of official Israeli policy throughout Area C.
As part of this policy, in 2016, Israel demolished 274 homes in the West Bank (excluding East Jerusalem), thereby rendering homeless 1,134 individuals, including 591 minors. The extent of devastation Israel wreaked in 2016 outstripped the number of homes it demolished in 2014 and 2015 combined. Demolition operations by the Israeli authorities focused primarily on three major regions: The South Hebron Hills, the Maale Adumim area and the Jordan Valley. Efforts to drive dozens of small shepherding and farming communities out of Area C are particularly palpable in these areas. In the Maale Aumim area, which includes land that Israel refers to as Area E1, authorities demolished 49 dwellings; 224 people, including 115 minors, were rendered homeless. In the South Hebron Hills, in communities facing the threat of expulsion, authorities demolished 34 residences; 166 people, including 87 minors, were rendered homeless. Demolitions were particularly extensive in Jordan Valley communities: 551 people, including 291 minors were left homeless after authorities demolished 123 residences there. Israeli authorities continued their discriminatory policies against East Jerusalem’s Palestinian residents as part of an overall policy designed to cause Palestinians to leave the city. Their actions are also part of efforts to achieve a demographic and geographic reality that would frustrate any future attempt to question Israeli sovereignty in East Jerusalem. In 2016, Israeli authorities demolished 73 homes in East Jerusalem. Fifteen others were demolished by their owners after receiving demolition orders from the municipality. They demolished their own homes in order to avoid being charged by the municipality for the cost of the demolition and hefty municipal fines. All told, authorities rendered homeless 295 people, including 160 minors. This is the largest number of home demolitions recorded in a single year since B’Tselem began documenting home demolitions in East Jerusalem in 2004. Authorities also demolished 48 non-residential structures. These figures reflect a sharp increase in the number of demolitions in East Jerusalem. In contrast, authorities demolished 47 homes in East Jerusalem in 2015. To sum up, despite the differences between Area C and East Jerusalem in terms of which authorities operate in each area and the laws applied by Israel, the policy Israel pursues in the two areas is similar, and designed to minimize the number of Palestinians in as much land as possible. Authorities cynically cite illegal construction as a pretext for the demolitions, while at the same time authorities are the ones that prohibit legal construction by Palestinians. They avoid promoting or approving development and construction plans for Palestinians and then say they cannot issue building permits because there are no plans. Figures recently provided by the Civil Administration to Israeli NGO Bimkom would seem to indicate that in the first six months of 2016 the Civil Administration issued 37 building permits for Palestinians in Area C.
This number not only falls far short of meeting the needs of the population, inquiries by Bimkom revealed that the Civil Administration neglected to mention that virtually all the permits (35 permits) were issued at its own request for lots in the al-Jabal West site, where the Civil Administration plans to forcibly move Bedouin communities currently living east of Maale Adumim. This means the number of construction permits in Area C issued in response to applications by Palestinians is practically non-existent. Israel pursues this demolition policy while willfully ignoring the reality it creates for Palestinian residents, treating this reality as if state authorities bear no responsibility for it having come about. With no avenue available to them to build legally, Palestinians are left with no choice but to build their homes without permits, and then live in constant fear of losing them and their sources of livelihood to demolition. The state is forcing tens of thousands of people to live in inhuman conditions, without basic living conditions and with no hope or possibility of bettering their situation. This policy, implemented on the ground for years, is unlawful and immoral. It constitutes the forcible transfer of protected Palestinian residents within the occupied territory, whether directly, through the demolition of their homes, or indirectly, through the creation of impossible living conditions. This policy, which all authorities work to uphold, severely and directly violates the most fundamental human rights of tens of thousands of Palestinians, and indirectly those of hundreds of thousands more. At the same time, the policy also offers decisive evidence that Israel has long-term plans to continue controlling the area, while oppressing and dispossessing its residents. 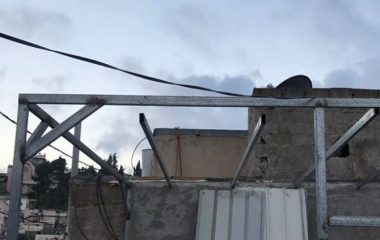 Israeli soldiers invaded, on Tuesday morning, the town of al-‘Eesawiyya, in occupied East Jerusalem, before forcing a family of eleven out of their home, and demolishing it. Media sources in Jerusalem said dozens of soldiers and police officers, including undercover soldiers, invaded the town, before breaking into the home of Saleh Abu Turk, and forced him and his family out of their property. The sources added that the soldiers prevented the family from removing their furniture and belongings from the property, before demolishing it. Abu Turk said a demolition order was issued against his property several months ago, but he went to court and managed to achieve a ruling delaying the demolition until February 08, 2017, in addition to being ordered to pay a 25.000 NIS fine, which he is still paying. He added that after the scheduled demolition date passed, he never received any further order setting a new date, and the demotion was carried out without a prior notice. The Palestinian lived in the property along with ten family members; six of them are children under the age of 18. The Israeli Occupation Forces (IOF) notified late Monday a number of Palestinian facilities with demolition in Qasra town, south of Nablus. Local activist Bashar Qaryouti revealed that Israeli authorities notified four local residents to demolish their facilities within 14 days under the pretext of being built in Area C.
The notified facilities include three houses, three agricultural rooms and two water wells funded by Canadian institutions with the aim of protecting Palestinian agricultural crops from Israeli settlers’ attacks.